Do you have a Newfoundland Dog, or have you admired these stately giants at a dog show or dog park? A close friend of mine raises them, I have always been awed by their size and mellow disposition. So I decided to find out more about them from one of the most experienced breeder/exhibitors I know. She has written a book on the breed, and here are some Newfoundland dog characteristics that I discovered. They are a fascinating and versatile breed. The stately black or black and white Newfoundland is a water dog of massive proportion, standing 26 to 26 inches at the shoulder and weighing from 100 to about 150 pounds. The breed is believed to have originated on the island providence of Newfoundland in Canada, and the original breed standard was written over 100 years ago. References to the breed date back to the early 1600s, but during the late 1700s a law was passed in Newfoundland prohibiting ownership of more than one family dog. The Newf population on the island diminished until the early 1900s, but it began to flourish in England. Today’s AKC Newfoundland Breed Standard traces back to the type established in England. In his native island home traditional tasks of the Newfoundland Dog included hauling cartloads of fish from the docks, hauling milk or other products for vendors to sell from their carts, pulling sleds loaded with wood, or pulling a heavy net full of fish into a boat. Today many Newfs are trained as lifeguards and water rescue dogs. I was amazed to learn that some are even used for hunting as they are natural retrievers. 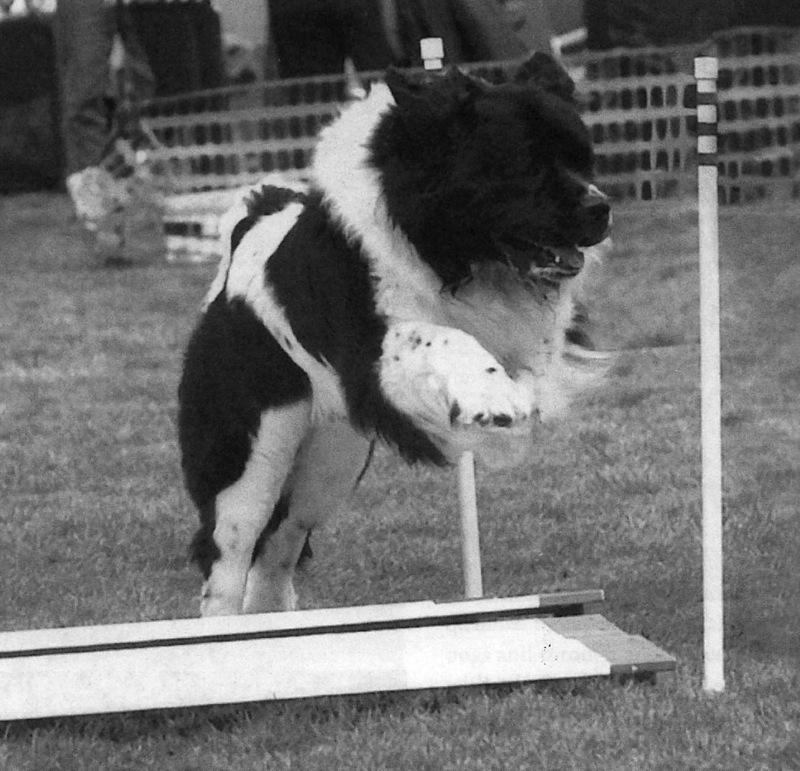 Newfoundlands also excel as therapy dogs and compete in water dog contests, agility, and carting, among other performance and sporting events. The dogs have an exceptionally gentle, docile nature. Sweetness of temperament is probably the single most important characteristic of the Newfoundland breed. Colors range from solid black, brown or gray with white acceptable on the chin, chest, toes, and tip of tail. The Landseer has a white base coat with black markings. The head is solid black with or without a blaze. The double coat of an adult Newfound is flat, water-resistant, with a soft, dense undercoat and harsh outer coat. A unique characteristic of the Newfoundland is their large, webbed feet. Lanseer Newfoundland competes over the broad jump in an obedience class. Like all large breeds, Newfoundlands are sometime affected by elbow or hip dysplasia, as well as luxating patella—all genetic in origin. Other hereditary problems include cystinuria, an abnormal excretion of cystine in the urine which causes kidney stones and kidney failure, bloat and gastric torsion, and various heart problems, especially subaoritic stenosis. Panosteitis and osteochondritis dissecans are also transmitted genetically. Older Newfoundlands (around 11 years of age) are prone to geriatic onset laryngeal paralysis polyneuropathy, which is often first expressed as throat-clearing or gagging, followed by breathing and swallowing issues accompanied by muscle wasting and weakness. Genetic studies are currently being conducted on these and other diseases that affect Newfoundlands. The Newfoundland is an active breed. The Newfoundland Club of America recommends that the minimum size dog run of at least 12 ft. x 12 ft. and at least 6 ft. tall. The first Newfoundland to receive the Ken-L Ration Dog Hero of the Year Award, Dirigos Magnificent Villa, CD, weighed 150 pounds and cleared a 5 ft. fence to save her “child”, Andrea (Newf Tide, Spring 1984). Some Newfs are diggers and this, too, should be considered. Extending the fence underground or putting a cement base around the run will eliminate this problem. While cold is rarely a problem, Newfoundlands can suffer from heat stroke. Shade is a must, even in winter, and plenty of clean, fresh water should be available at all times. They do best in cooler, non-humid climates. Feeding two smaller meals rather than one large meal and restricting exercise after feeding are recommended precautions to prevent bloat. Newfoundlands have a tendency toward pica (eating non-food items) so be aware of this and remove them from areas that might be harmful such as freshly treated awns or chemically sprayed trees. Charcoal briquetttes have additives that could be harmful, and wood or bones can splinter. Other items that are swallowed can cause an intestinal blockage. If your dog has this tendency, pick up and prevent access to non-food items that he might find tempting. The Newfoundland is not an easy care breed when it comes to grooming. Neither do they need daily grooming. A weekly brushing and attention to nails is ideal. When brushing, work from rear to front and from bottom to top. Lift the hair in front of the brush with one hand while brushing through the underlayer of hair in the direction of growth. Brush one layer, move the left hand forward to release the outer layer, and continue. Brush from the tail to the neck, then from the lowest point of the legs, chest, and ribs and work up. 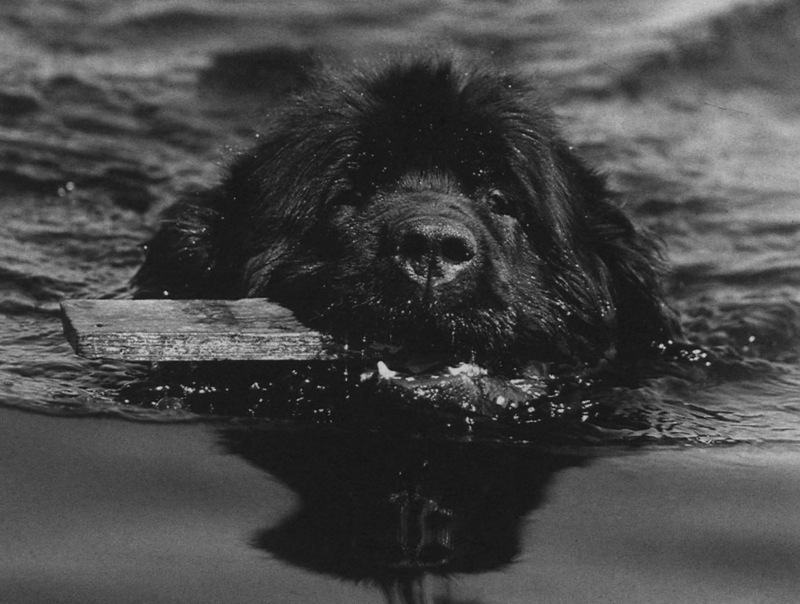 Newfoundlands love hiking, backpacking, carting, and swimming. They are natural retrievers and can be used for duck hunting. 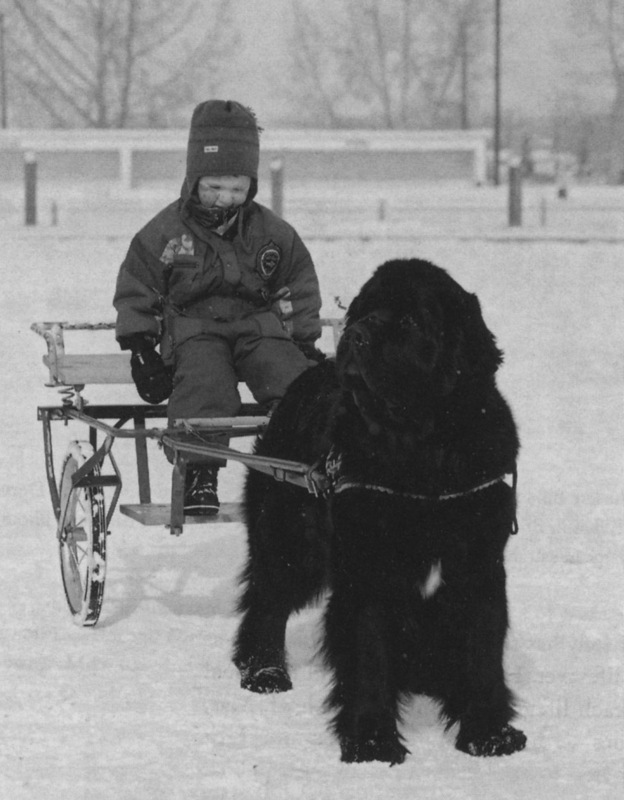 A youngster carting with a Newfoundland dog. Swimming is wonderful exercise for Newfs, but, since they seem to have no fear of water, some caution needs to be employed. Joanne Riley warns that you should be sure your dog will come when called before you let him loose in the water. Even then, some Newfs get so carried away with swimming that they continue far out beyond the reach of your voice. Leashes can get caught on something under the water, the dog can swim into the path of boats or water skiers (who may not see them in time), and puppies can be carried down stream by the current. Newfoundland owners and their dogs compete in obedience, Rally obedience, agility, conformation shows, and tracking. Special competitions for Newfoundland include carting, draft dog, and water tests. As mentioned earlier, Newfoundlands excel as therapy dogs, especially in nursing homes or with children. Perhaps best of all, they make great family dogs and are suitable companions for a young child to a senior citizen. You can read more about Newfoundlands in JoAnn Riley’s book, The Newfoundland: Gentle Giant. Do you have a Newfoundland dog? I’d love to hear about him or her! What do you do with your dog? What is the longest living Newfoundland you know of? What other events besides those listed above have you heard of Newfoundlands doing? Do you know about an especially helpful Newfie therapy or service dog who’s story you would share? This entry was posted in Breeds of Dogs, Dogs, Newfoundland and tagged carting with dogs, diseases of the Newfoundland dog, Landseer Newfoundland, Newfoundland, Newfoundland dog size, Newfoundland dogs, Newfoundland puppies, Newfs, purebred dogs, water dog tests. Bookmark the permalink.